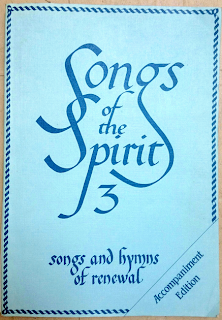 This book follows from Songs of the Spirit volume 1 and volume 2, and so starts numbering hymns from 201. It was published by Kevin Mayhew Publishers of Suffolk, England in 1987. Compiled by Damian Lundy FSC, it includes a Foreword written by him and dated Feast of All Saints, 1985. This acknowledges the help provided by young musicians Anne-Marie Walsh and Anthony Sharpe. Music origination (presumably meaning musical typesetting) was carried out by Musicprint Ltd of London, and the books were printed by J B Offset Printers (Marks Tey) Ltd. 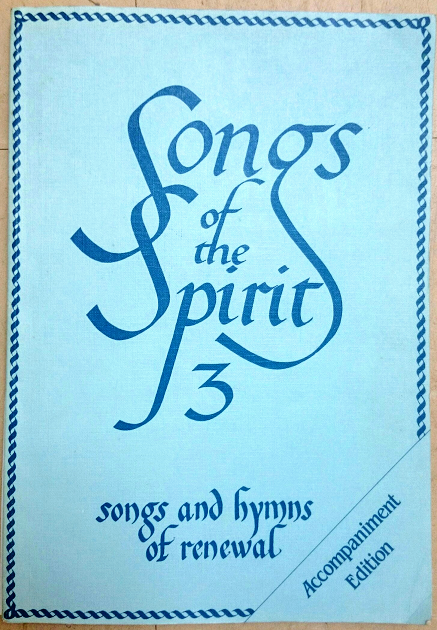 It includes 117 hymns, songs or Mass parts. Of these, 109 are in the English language, 4 are in Latin, and the rest are a mixture of Latin, English and/or Hebrew. The final 11 songs are repetitive mantra-style songs from the Taizé community. This book is different from earlier editions in that it includes a number of songs by overseas-based composers (John Foley, Carey Landry, Gregory Norbet, Frank Andersen). The book was published in several editions: The accompaniment edition is A4 size and soft-covered, meaning it is difficult to photocopy from or to use at a keyboard etc without damaging the book. The ISBN of the accompaniment edition is 0 86209 086 5. The book is now out-of-print, but copies are usually available on Amazon (UK and Ireland). This listing is based on the Accompaniment edition, 1987 printing. If you own the copyright to any of these words, and would like to give permission for items to be made available here, or to provide a link to sources where they are still available for sale, please leave a message in the Comments box at the bottom of the page. Key: Verses: Am. Chorus: A.
I am calling you to step out on deep waters / Do not say "Lord I am not worthy"
Lyrics: Verses 1 and 2: Himmie Gustafson. I rejoiced when I heard them say "We go to God's own home"
Can be sung either as a hymn, or without accompaniment as a round (score indicates entries for this).